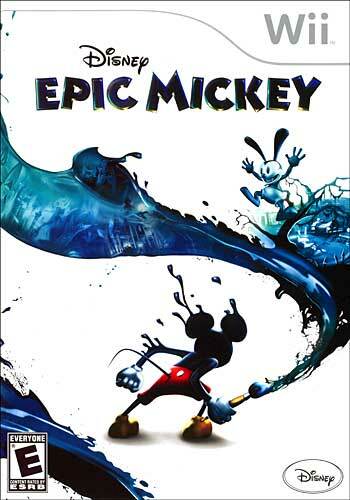 The Plot: Epic Mickey begins with a flashback as our well-known hero, Mickey Mouse, discovers a mirror he can walk through in his own home. The mirror, in question, takes him into another room where Yen Sid, the wizard from Fantasia, is building a new world for forgotten Disney characters called Wasteland, a paradise for the old and unloved to go and flourish, using a magic paint brush to paint the world. When Yen Sid leaves, soon Mickey gets his hands on the brush and tries to make it better (possibly by adding the water tower in Disneyworld), but unfortunately creates the Shadow Blot instead. Using Thinner, he subsides the beast but in turn runs the Thinner all over Wasteland by accident, turning the world into an actual wasteland. Mickey soon runs off back into his own world, but the damage had been done. 25 years later to the present day, Mickey has grown into the famous mouse folks at home know him for. Having lived the success of other characters dream’s they’ve had, he was without a care in the world… until one day, while asleep in bed, he felt something hit him. Awakened and to his fright, the Shadow Blot returned from the mirror that laid waste as it dragged our mousey hero through and into the world he had originally destroyed. The villains are after Mickey’s heart, showing fandom love for the mouse. Without this, no one can escape Wasteland. Armed with Yen Sid’s paint brush, can Mickey fix his own carnage and escape in-tact. The Good: I must admit, the plot to this game is amazingly original. It’s almost 4th-wall breaking. Who’da thunk that fandom would become a future plot point for a Disney cartoon, much less a Disney video game. The controls work fine for the most part. The wiimote/nunchuck style works pretty well with the game. It’s accurate, not too stiff, and not too picky on what to do. Shaking the wiimote lets Mickey do a spin attack, ala Mario Galaxy but not as useful. The main use is to interact with enemies and environments that require hitting a switch. Mickey can also use a double jump, which can be used to correct jumping errors done while you hop from place-to-place. But probably one of the more unique aspects is the Paint vs Thinner use the game offers. Paint lets Mickey restore the background and characters, as well as make enemies (and bosses) his allies. Thinner erases background objects and NPCs (as well as enemies and bosses). Depending on what you use more, the ending of this adventure will change, whether it’s for better or worse. It will also change how people see you as you progress, sort of like Fable. Don’t even get me started on the many, many throwbacks to older Disney attractions this game shows off. For example, the Haunted Mansion, the Dumbo carnival rides, heck even black & white characters (like Horace Horseshoe, remember him?) make an appearance. Disney has indeed not forgotten about these characters, and it shows. At some points as you transition from place-to-place, you have to go through classic 2D platforming as you travel through old cartoons made throughout Disney’s history. Whether it’s a scene from Fantasia or even one of Oswald the Unlucky Rabbit’s cartoons, you’ll be traversing through quite a bit of them, and they all have their own unique charm. 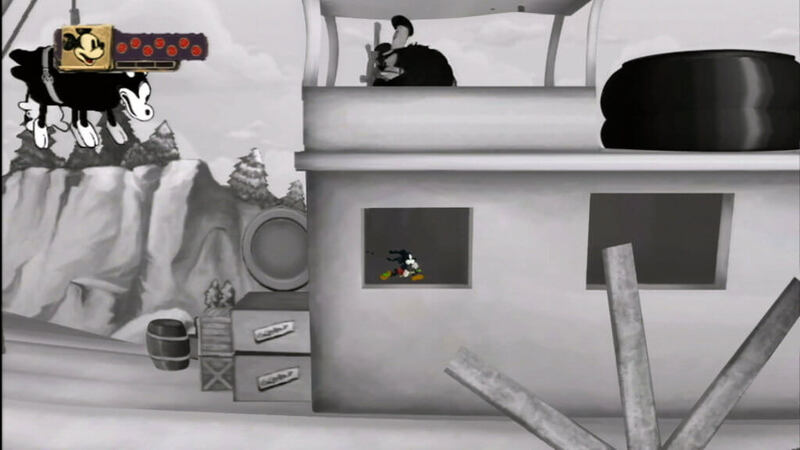 The Bad: Sadly, Epic Mickey isn’t 100% perfect. There ARE some very serious flaws within the game itself. First off, the camera, controlled by the wiimote’s d-pad offers little help in fixing camera glaring issues. The camera will sometimes get wonky and become stuck behind a piece of grass or even a bush. It seemed almost as if the camera was a last-minute placement and it seriously hampers the experience. It also effects how you paint (or thin). For example, if there’s a tall object blocking a part of your view, instead of painting where you should be, Mickey will instead be painting (or thinning) said foreground object instead of what you’re originally aiming for. It’s as frustrating as it sounds, and sometimes you’ll even be dropping yourself in an ocean of Thinner by accident just because the camera refuses to let you see what’s below you. At least they offer the player infinite lives. The movement controls can also be a bit stiff when it comes to direction. Mickey always starts movement by tiptoeing instead of just flat out running when he should be. While it doesn’t seem to be an issue at first, it can be nerve-wracking during mid-fight when movement is crucial and you get flattened because Mickey wanted to try and play Metal Gear instead of fighting. Extras: Gathering film reels in the 2D levels and trading them at the theater on Mean Street will not only award you with power ups and collective pins, but also two actual classic Disney cartoons: “Oh, What a Knight” starring Oswald and “The Mad Doctor” starring Mickey. A very cool bonus if I say so myself. You can also unlock concept art by purchasing them in the in-game shop. You can also rewatch any cutscene you’ve seen previously in the game in the Extras on the main menu. 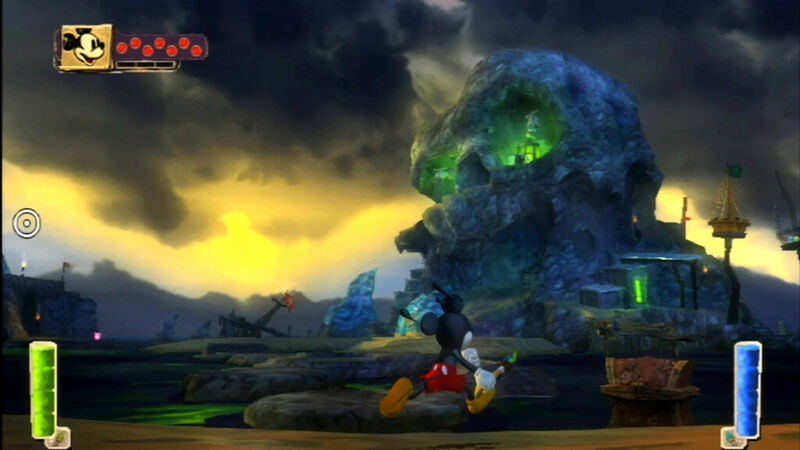 Final say: Epic Mickey is a fantastic game hampered down by a terrible camera with slow control and stiff movement. It’s a rather serious blow to what is essentially an amazing and well thought-out Mickey Mouse game. Disney fans will gobble this up in no time, but for normal fans, if you’re willing to put up with the camera issues then this will be a great choice for a good game.